Beautiful ride today. The grades were easier on this road than from Metema. For example, though we had two reasonable climbs today, the grades stayed a more consistent 5% than bouncing between 3% and 12%. Hence, I could put the bike in low gear and slowly ride up the hill. When not in steeper climbs or descents, the road generally rolled with very little that was actually flat. We went through agricultural areas with hay, some corn, cane and some other crops I didn’t recognize. There are still many goats and the donkey is the general beast of burden so far. We crossed several small villages to keep things interesting. 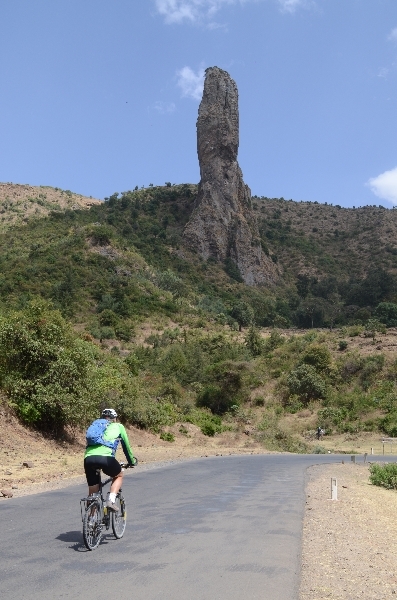 Started the day with 14km of mostly descent coming across and then down from Gondar to the road intersection from Metema. After this passed the airport and all new road to us. In early morning saw many kids with school books. As we left the city the terrain was rolling with at least as much down as up. Some kids and most were even friendly. 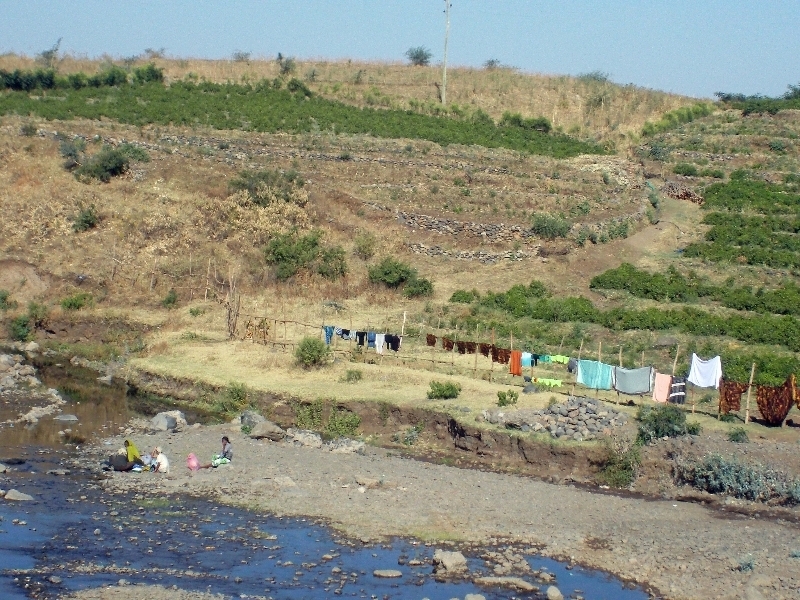 By 44km we came into a valley and started a gradual climb as we crossed a larger village. After this the first steeper climb over a ridge and on other side was lunch. It was a little warmer after lunch, but temperatures at 2000m are nothing like we had in Sudan. I stopped briefly when saw a commotion ahead surrounding two New Zealand riders. One had a flat and was fixing it. I came in and helped keep some of the kids back otherwise fixing a flat becomes more fun with ~30 kids around poking and crowding to see how it is done. Not much later was a coke stop with several others at 80km. It was well placed since here was also the second larger climb of the day. On other side a good descent to 96km and right turn into the wind. Still pretty agricultural areas where started seeing larger haystacks and also some large square barns. At one point a car was stopped as occupants were busy strapping down a sheep to the roof that might have gotten loose. A bit much for me since the sheep was still alive. We camped at vacant field off a road intersection. It was little past three and so nice ride overall. 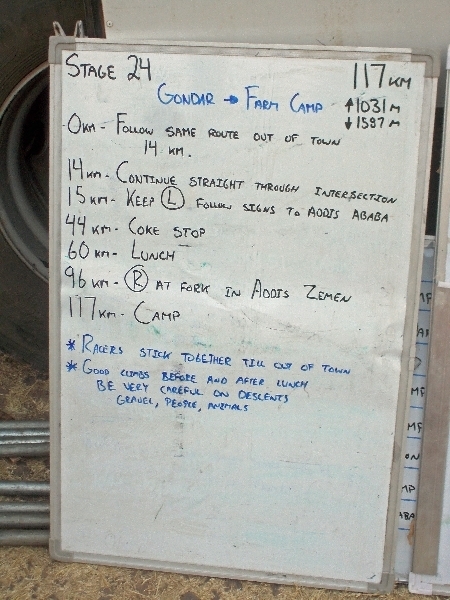 As was case in Ethiopia, our camp was marked with a red perimeter line. Watchful villagers from the area where outside looking in at the overall commotion as our group arrived. After dinner, myself and two others were on pot scrub duty. This duty rotates amongst the riders and isn’t particularly onerous as only after a month did it rotate to me.